The redesigned Orange Terror Bass has arrived — and it sounds better than ever. 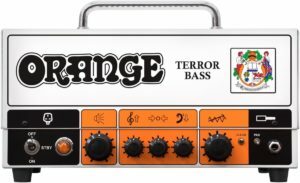 With a tube preamp and 500-watt solid-state power amp, the Terror Bass mimics the tone of Orange’s flagship AD200 bass head in an affordable, gig-friendly package. The front panel of the Orange Terror Bass remains virtually the same as the original, but adds a new clean switch, delivering more headroom and a noticeably smoother clean tone. From crisp pop sounds to gritty doom metal sludge, the Terror Bass can do it all. A pad switch on the front for active basses takes 6 dB off the input sensitivity, and a tube-driven effects loop ensures that your pedals will sound their best. 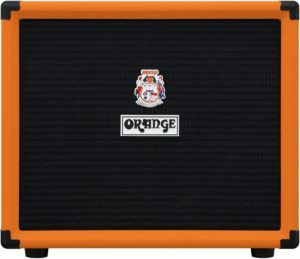 At 4 ohms, the Terror Bass’ Class D power amp pushes a mean 500 watts, but can be dialed back to 250 watts at 8 ohms, making the Orange OBC112 (or a stack of OBC112s if you really want to move some air) the perfect companion. A limiter switch on the back panel of the head prevents the output stage from being pushed too hard into a 4-ohm load.